Snapping and stringing beans used to be required before using beans in recipes. Today, the real "string bean" is a thing of the past. Growers have bred beans that no longer contain the tough strings, so today's string beans are normally called "snap" beans. 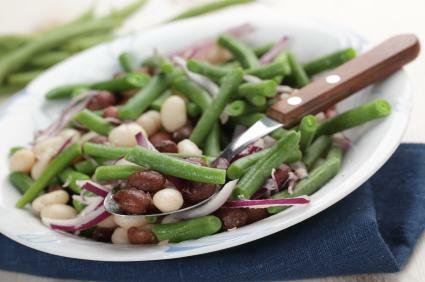 When you see them called for in string bean recipes, you can use green beans or snap beans interchangeably. 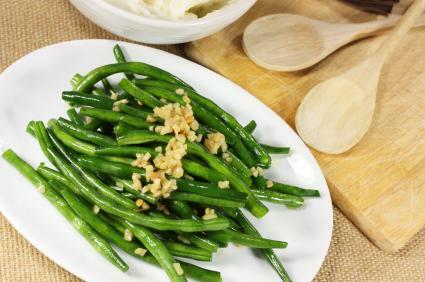 String beans can be eaten plain, used in salads or incorporated into a side dish or even a soup. 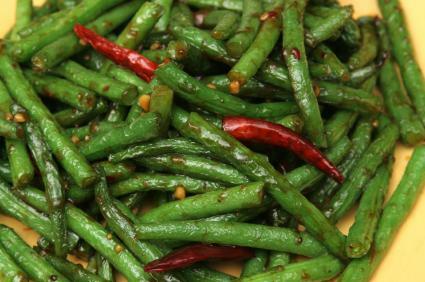 Try out the following string bean recipes as a tasty and simple side dish. Wash and trim string beans. In a medium sauté pan, heat olive oil. Sauté beans on high for 2 minutes. Add the garlic and wine to the pan and stir to mix. Reduce heat and simmer on low for 20 minutes. Wash and trim the string beans. In a large pot of salted water, cook the beans for 5 minutes or until just tender. Drain beans and transfer them to a bowl of ice water to cool. Drain beans and pat dry. In a large sauté pan, melt the butter. Reduce the heat to medium and add the thyme, mustard, and garlic salt to the butter. Add the beans to the pan and toss until coated and heated completely. Sprinkle the beans with the almonds and garnish with thyme. Steam in colander over a saucepan for 5 minutes. Drain beans and transfer to a bowl of ice water and allow to cool. In a large wok sprayed with cooking spray, add gingerroot and garlic. Sauté gingerroot and garlic for 1 minute and then add the beans. Sauté for 5 minutes, and then add the 2 tablespoons of water and the remaining ingredients. Stir well and cook for another minute or until thoroughly heated. When you buy string beans, look for long, thin pods that are free of blemishes. They should be crisp and have a bright green color. Avoid broken beans or beans that look as if they have damage from insects. Beans should be smooth rather than lumpy (lumpy beans are old and too mature), and they shouldn't be wrinkled. The best time to buy fresh green beans is around June through October. Canned green beans tend to lose a lot of their flavor and texture in the canning process. If you can't find fresh green beans at your supermarket, try looking for fresh frozen green beans for your recipes. They come in a variety of types and sizes, from French-cut to the tiny and tender "haricot verts." Choose a good, reputable brand and frozen green beans can be nearly as good as their fresh cousins. Bush beans: This refers to the way the beans grow. Bush beans don't need to be staked up or trellised, and they come in many varieties. French-cut beans: These beans are cut along the length of the bean, rather than across the width. This makes them extremely long and thin. This can also sometimes refer to regular green beans that are sliced diagonally rather than straight across the bean. Haricot verts: These are very thin and extremely tender beans; this is the French term for these beans. They are much smaller than traditional green beans and have a more intense flavor. Pole beans: This name also refers to the way the beans grow. These beans have to have support as they twine their way toward the sky. They are easier to pick than bush beans, but otherwise, they have essentially the same characteristics. Yard-long beans (long beans): These beans often show up in Thai or other Asian recipes. They also keep better in the refrigerator than at room temperature, and they are drier and firmer after cooking than other varieties. Green beans, and all beans for that matter, are part of the legume family of plants, which includes peas, too. There are two types of beans - fresh and dried. Green beans are from the fresh bean side of the family and are actually harvested when they are considered immature. If they were mature, they would dry and join the dry bean side of the family. There are two general types of green beans that you'll find in the produce section of your local grocery store. One type has round, thin pods, while the other type has flat, broad pods. It seems that the flat types tend to have a more powerful "green bean" flavor. Green beans actually originated in areas of South and Central America and, since they originated in warm climates, they don't tend to keep too well in the refrigerator. If you do refrigerate them for your string bean recipes, make sure to keep them tightly wrapped in plastic. They are tender and relatively delicate and you should eat them quickly after purchase - a couple of days at most. Green beans contain a variety of essential nutrients and vitamins, like Vitamin A, C, and K, along with magnesium and many other minerals. Plus, they have less than 50 calories per cup. In addition, string beans are tasty and delicious.